NETWORK FINALS: THE EMMYS adjusted to 2.4, just below last year and thus its lowest-rated telecast ever. 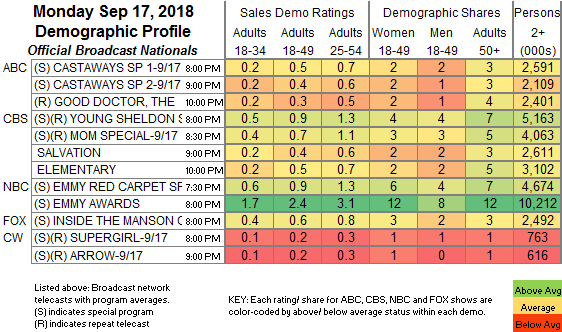 Elsewhere, NFL preemptions probably affected ABC, where CASTAWAYS adjusted down 0.1/0.2, and the rerun THE GOOD DOCTOR lost 0.3. CABLE HIGHLIGHTS: ESPN’s MONDAY NIGHT FOOTBALL towered over Monday cable at 3.99, up from last week’s 3.78/3.68 doubleheader. VH1’s LOVE & HIP-HOP ticked down to 1.01. USA’s WWE telecast was at 0.96/0.90/0.85, compared to last week’s 0.91/0.89/0.88. Bravo’s REAL HOUSEWIVES OF ORANGE COUNTY slipped 0.02 to 0.56. On AMC, BETTER CALL SAUL gained 0.02 to 0.41, and LODGE 49 was down 0.02 to 0.08. On Food Network, KIDS BAKING CHAMPIONSHIP rose 0.06 to 0.36, and BAKED held at 0.20. 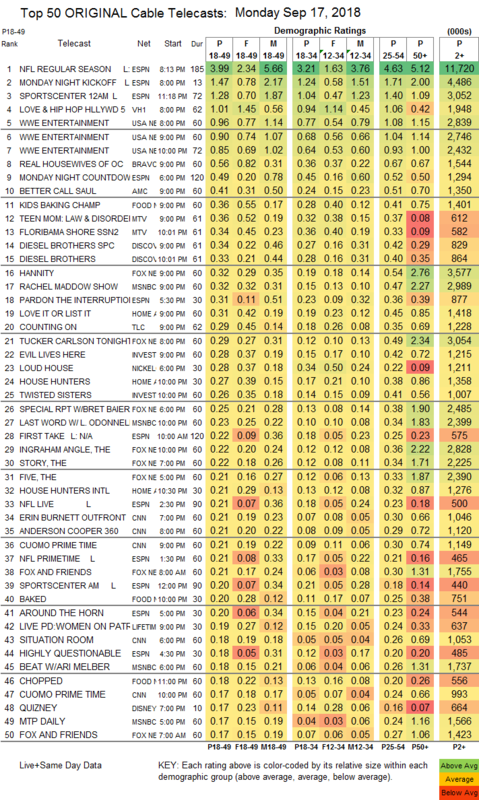 On MTV, TEEN MOM climbed a tenth to 0.36, and FLORIBAMA SHORE ticked down to 0.34. Discovery aired 2 hours of DIESEL BROTHERS at 0.34/0.33, compared to last week’s 0.44. Fox News’s HANNITY and MSNBC’s RACHEL MADDOW SHOW tied in the 18-29 demo at 0.32, with HANNITY also at 0.54/3.6M and MADDOW at 0.47/3M, and with CNN’s ERIN BURNETT OUTFRONT at 0.21/0.30/1M. On HGTV, LOVE IT OR LIST IT fell a tenth to 0.31, HOUSE HUNTERS dropped 0.15 to 0.27, and HOUSE HUNTERS INTL was down 0.19 to 0.21. TLC’s COUNTING ON gained 0.03 to 0.29, and LITTLE LIFE ON THE PRAIRIE ticked down to 0.15. On ID, EVIL LIVES HERE shrank by 0.07 to 0.28, and TWISTED SISTERS was down 0.11 to 0.26.